Rising above the skyline of District 2 and offering stunning river and city views, Gateway Thao Dien – comprising of luxury apartments, serviced residences, integrated facilities, boutique retail space, a F&B courtyard with international standard restaurants and cafes – is the most sought after new address in Thao Dien. Especially Thao Dien Gateway residents will move easier routes include the Metro station Ben Thanh - Suoi Tien is being started by the state investment. It only takes 7 minutes to District 1 and District neighborhood. Promises to be a class apartment projects in the area east of the city. - Next to metro station. - 10 mins to D.1. - Education: British international school, International school of HCMC, The American school, Australian international school, Smart Kids kindergarten. - Medical: Family Medical Practice, Thao Dien medical station, The European dental clinic. •The Aspen: including 42 floors – 233 units. •The Madison: including 42 floors – 206 units. •The Albany: including 8 floors – 22 units. •The Berkley: including 20 floors – 85 units. 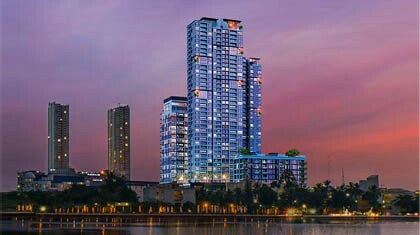 • Foreigners are allowed to buy and own these apartments.